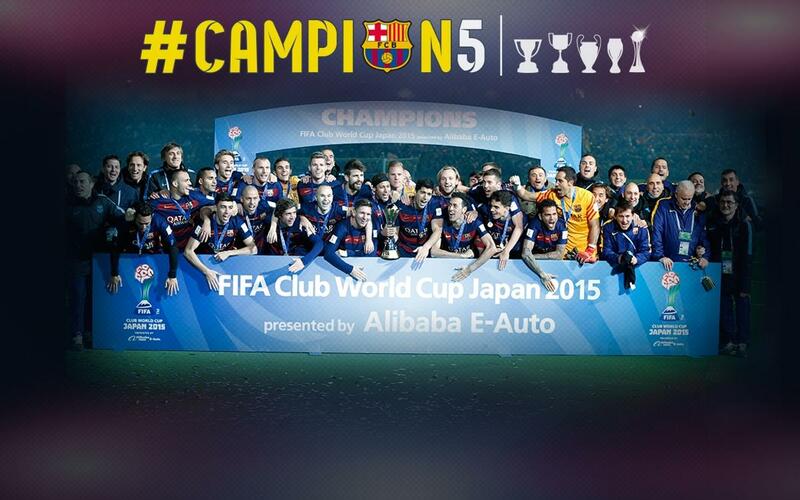 FC Barcelona are world champions again! On a glorious night in Yokohama, the Catalans won the coveted title for the third time with a truly remarkable performance against South American champions River Plate. The win caps a marvellous year in which the team has matched the terrific trophy haul of five in 2011. There was good news for Barça before the game had even started, with both Messi and Neymar declared fit and included in the starting XI. As expected, Barça provided the more aesthetically pleasing football, but River immediately made it clear that they weren’t just here to admire the opposition. It took 11 minutes for Barça to have their first real chance, when Barovero’s save was so impressive that Messi shook the River keeper’s hand! Barovero proved to be the most decisive player of the first half hour, although even he wasn’t over-tested by a Barça frontline that was struggling to create meaningful chances. But River weren’t causing too much trouble at the other end either, and it took 28 minutes for Mora to have their first proper shot on goal. And then after 35 minutes, Barça finally got off the mark. Neymar rose to meet a cross from Alves in the River area, and provided a neatly headed assist for Leo Messi to tastily flick home a record-equalling fifth goal in the Club World Cup. Not even renal colic can keep the best player in the world down for long! The goal was the inspiration Barça needed, and they barraged the River area for last ten minutes of the half. But although Suárez came frustratingly close right on the whistle, River weathered the storm and probably felt relieved that there was only one goal in it at the interval. Just four minutes after the restart, there were suddenly two goals between the teams. Sergio Busquets did brilliantly to pick out an unmarked Suárez and the Uruguayan charged forth, blasting a shot that was simply too hot for Barovero to handle. Party time. The trident was now unleashing its full potential, and anything River did was just leaving more space at the back for the Barça trio to leap into. It was an absolute master class, and it was looking extremely unlikely that the Catalans weren’t going to be building on their lead. Indeed, after 68 minutes it was 3-0. Neymar provided the cross and Luis Suárez met it with a stunning header into the top corner! Unsurprisingly, the MVP award already had Luis Suárez’s name on it, and he'd also matched the all-time tournament record of five goals that Messi had set earlier on! That was as good as game over, but to their credit, River still kept battling, forcing two particularly fine saves out of Bravo, the latter being nudged onto the post after Martínez had looked certain to score. But the Libertadores champions knew they were only battling for pride. The minutes ticked down, and Luis Enrique could even afford to take off Mascherano and Neymar for the last few minutes. Barça had already done what they had to do. World champions for a record third time, and five out six major trophies collected in 2015. Is there any limit to what this extraordinary team can do? Força Barça!